Good Russian food in Harbin, Manchuria? Why, of course, but you need to go to the right place. Café Russia 1914 is in the heart of the pedestrian mall that is the hub of this Manchurian city undergoing a Renaissance. Established in 1914 by the Russian noble family who still own it, the restaurant was once named Lucia’s in honor of the grandmother. The restaurant is located about a half-mile block north of the Stalin Park Promenade (yes, they named a park after him) on the city pedestrian mall. You enter the medium-lit soft yellow dining room and encounter a subdued European bistro that you would expect to see in Rouen rather than in a garish Asian city like Harbin. Above a well-tended fireplace and mantel you will notice a large, painted, Mona Lisa-like smiling portrait of Lucia in her youth, done just about the time the original building was her family home. On an opposite wall, resplendent in Czarist uniform with too many medals and wearing a great muttonchop beard, is the Russian general who was also the founder of the Harbin Institute of Technology, today one of China’s leading universities. In addition, photos of the early 20th century Russian Orthodox and Russian Jewish communities are displayed, including those of the great 1932 Sonjiang River flood and the surprisingly efficient rescue efforts during the same. FEMA could take note of the cooperative spirit of both communities. Balalaikas, religious icons, and photos of prominent business and professional people of the era abound. I imagine you might want to know something about the food. The menu of some 20 pages, including photographs, offers popular dishes of traditional Russian food. Manchurian and Chinese beers are among the most popular drink selections. Highly recommended are the moist and delicately breaded veal cutlets, succulent beef- or chicken-filled piroshki, and of course the ground and lightly grilled beef-stuffed cabbage, the mainstay. Wash all this down with a few Chingdao or Kirin and you are ready to inspire friends and patrons with your expertise with the galunka, the well-known Cossack dance that requires stout legs and a high tolerance for liquor. Of course they have Stoli chasers, too. Maybe you are not so into after-dinner feats of fitness; you might choose to enjoy tea and chocolate cream pastries and enjoy the recorded music instead. If you go during the winter, after lunch or dinner you can walk a block towards Stalin Park, then cross the frozen-over Songhua River and see the famous ice-palace sculptures on Sun Island. 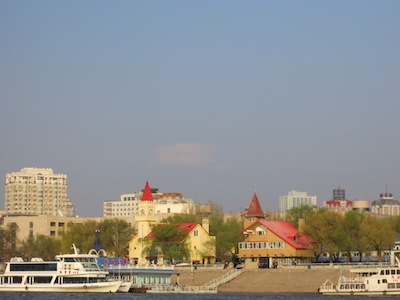 During the summer, when it really is Sun Island, you can catch a riverboat ride there to take in a Russian folk dance or folk play in the wooded resort areas. You might want to just enjoy a leisurely walk on the city mall (one of the few in any Chinese city of this size), shop the many Russian import stores, or tour the Harbin New Synagogue. Recently reopened as a Jewish cultural and heritage museum honoring the contributions of this community of twenty thousand people, this former synagogue (Haerbin Youtai Xinhuitang) located at 162 Jingwei Street contains an art gallery, photos, and exhibits of early 20th century Jewish life in Harbin. For restaurant reservations in Harbin call (0086-451) 8456-3207. Open from 9 a.m.-12 a.m. Location: Xitoujie (West Toudao St., Daoli) #57 on the mall. Price range for a medium-sized lunch or dinner is from $8-$16.